We were packed like sardines in Courrèges store located rue Francois 1er pumped with music and with people in a democratic move for crowd control. It was all standing, which also meant it was difficult to see her newly promised vision. Or, as the show notes states : “How the future is behind you.” This could also mean : let forget the past to free her of the specific codes of the house which built its name and aesthetic on space age. 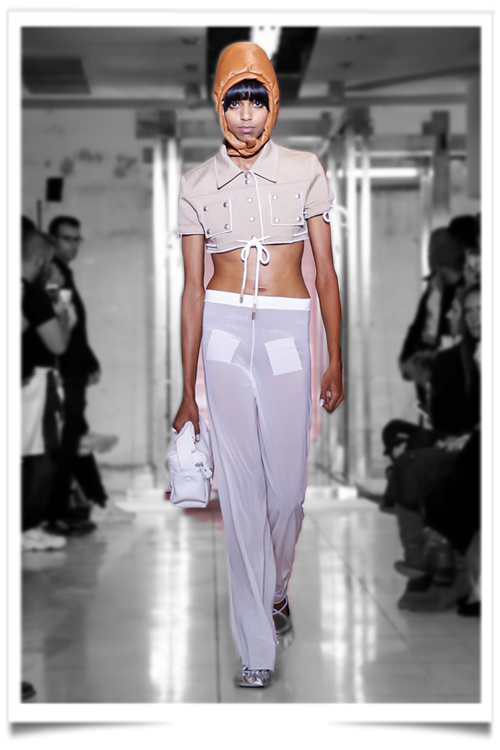 Then perhaps the cagoules and techno festival looks that came out made sense. 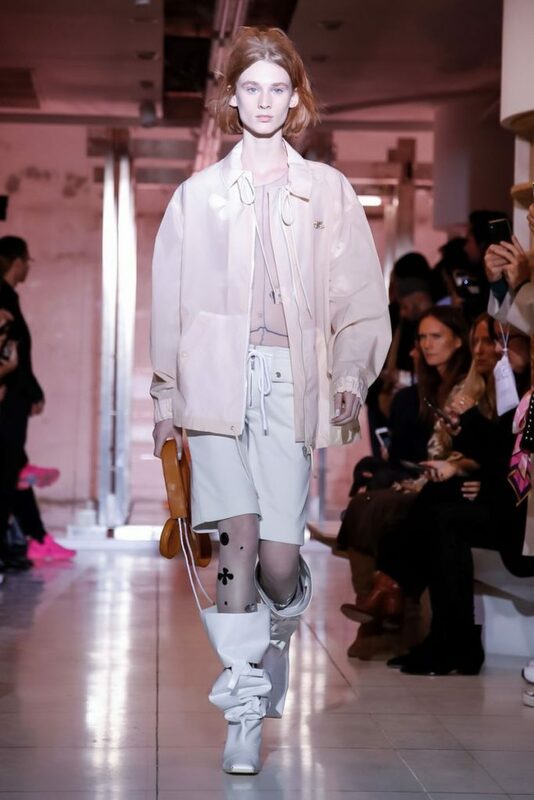 It was certainly as capsule and conceptual as Zobel’s predecessors, Sébastien Meyer and Arnaud Vaillant – the first official designers of the house since André Courrèges and his wife sold the company in 2011. There was only so far a series of jackets and knickers could take them, which is where, one imagines, this may end up too if Zobel doesn’t give us something more, something real that can be worn and resonates with today’s audience. Because this is what heritage houses seem to be struggling with right now. Who are they targeting and why? What is the house all about and why? What was the point of it even to begin with? How does that meet in the middle with a customer? Formerly of Jil Sander and Acne, there was certainly a utilitarianism and austerity to this collection from Zobel. That’s not really what space age is, though. At the time, it was meant to represent hope, ambition, and opportunity for the future, something new. This didn’t feel new. It’s only real saving grace, however, was a pledge to discontinue the manufacture of new plastics, of course a signature material of the brand. 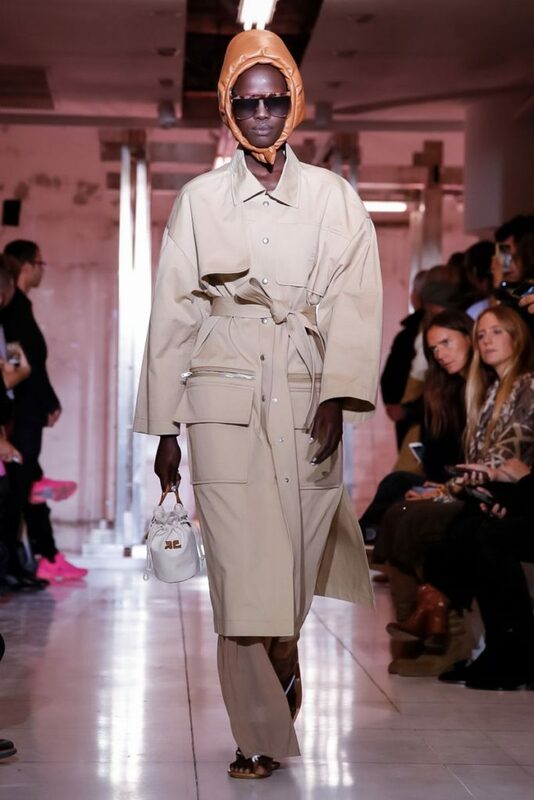 In a statement, the brand said it would work to use up its stock, numbering it for limited edition purposes and seek to develop alternative materials for the future. That’s all fine and good, but it should also work on finding an aesthetic point of view that works, too. Because without a desire to wear or buy, it all becomes waste anyway.